Both Greece and Germany would benefit from quitting and then instantly re-joining the European Economic and Monetary Union. If a country could leave the Euro, what would be the implications? Julian Le Grand argues that some of the Euro-member states should quit and instantly re-join (QIR) the European Economic and Monetary Union. Such an option would not only benefit deficit countries, such as Greece, but also surplus countries, such as Germany. One answer is for member states to quit the European Monetary Union then instantly rejoin it either at at a weaker rate for deficit countries, such as Greece, or a stronger rate in the case of countries in surplus, such as Germany. The problems facing the Eurozone have been ascribed to several different causes, including overspending by the governments of peripheral members of the Eurozone, the debt problems faced by banks and households throughout the zone, and the refusal of the European Central Bank to play a role as lender of last resort. However, most analysts agree that the principal problem concerns the differences in the trends for competitiveness of the members of the Eurozone. 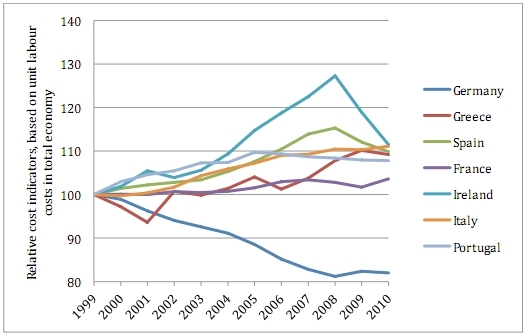 Since the introduction of the euro, there has been a sharp loss of competitiveness (as shown in Figure 1, which shows relative unit labour costs) for the weaker members of the zone, such asGreece,Ireland,Italy,PortugalandSpain, and a dramatic gain in competitiveness by, particularly,Germany. In fact Germany and Austria are the only Eurozone countries to show any increase in competitiveness over the period: Austria by 1% and Germany by a massive 20%. This has contributed to the massive trade imbalances, and the consequent deficit financing problems, that have characterised the current crisis. This problem of imbalances in competitiveness between countries cannot be resolved by most of the measures currently in place or about to be put in place. In particular, cutting government deficits, balanced budget rules and support for the banking system do not directly correct the underlying trade imbalances. However, the obvious alternative – for the weaker countries to withdraw from the Euro, to introduce a new currency and to devalue – is also deeply unattractive. Quite apart from the political and economic implications for the Eurozone as a whole of one or more countries leaving it, there are enormous economic and practical difficulties that face any country introducing a new currency. One way of overcoming at least some of these problems would be the following: At a given moment in time, a deficit country withdraws from the Euro and denominates all its financial transactions in a temporary currency at a given exchange rate. It then immediately rejoins the Euro but at a weaker exchange rate. I call this QIR, for quit and instantly rejoin. This form of QIR would be devaluation with the same beneficial consequences for improving a country’s competitiveness, but without all the practical problems associated with introducing a new currency. Especially in a world where many transactions are undertaken electronically, it would be relatively simple to implement, with all prices and wages still denominated in Euros but marked down by the amount of the devaluation. It would be socially and politically more acceptable than austerity measures such as direct wage cuts, since it would leave households’ real incomes largely unaffected – except for those who spend large sums on imports or who have large foreign debts. Since the exit would be temporary – indeed almost instantaneous – it should help overcome the legal difficulty that no Eurozone country can officially leave it. The principal losers would be those who spend a large portion of their income on imports or who have debts to institutions outside the member state concerned; these are likely to be among the relatively well off, and thereby perhaps better placed to take some of the pain than those bearing the burden of the austerity measures already in place. There are even more powerful arguments for applying the basic idea of QIR to surplus countries. In this case, the country concerned would re-join at a stronger rate. The obvious candidate for a revaluation QIR of this kind would beGermany. The country would benefit significantly, economically, socially and politically. German households would have higher living standards, due to their increased purchasing power over imports and for foreign travel. Apart from a one-off price rise (matched by a parallel rise in money wages), the overall impact would be deflationary, which should appeal to German monetary sensibilities. And Germany would not have to pay to bail out the rest of the Eurozone. The principal risks associated with either the devaluation or revaluation forms of QIR are the same as those associated with any devaluation/revaluation. They include the danger of destabilising capital movements and the associated difficulties for the banks, and that of debts (including sovereign debt) owed to institutions outside the relevant Member State. The risk of capital flight from deficit countries is obviously real, although it is probable that most of the mobile capital has already left the countries concerned. However, it is a problem associated with any devaluation involving a convertible currency; yet it has not stopped such devaluations in the past, nor limited their long-term effectiveness in restoring competitiveness. Moreover, it can be at least partly addressed by temporary capital controls. Given the long-term improvement in the trade and general economic prospects of the Eurozone following QIR, the foreign debt problem will be temporary, but, if acute, may be resolved by restructuring short-term debt into long-term debt. The QIR options for surplus or deficit countries will not resolve all the difficulties facing the Eurozone. To prevent the resurgence of competitiveness problems, QIR would need to be complemented by structural reforms within Eurozone members, especially for the labour market within deficit countries. Government deficits would still need to be curbed in the long-term – though, with the economic stimulus provided by QIR, this should prove much easier than now. Nor is QIR devoid of practical and political difficulties of implementation. But then so have all of the alternative measures that have been proposed which aim to tackle the crisis; and a respectable case can be made is that QIR in many ways is the ‘least worst’ option. Moreover, it does have one cardinal merit, one that many, even most, of these alternatives lack: it addresses the central problem of competitiveness. This article is based on Julian Le Grand’s submission for the 2012 Wolfson Economics Prize, QIR and EMU: A Proposal for Managing a Member State’s Departure from the European Monetary Union. His submission was one of four to receive an honourable mention. Full text. Julian Le Grand is the Richard Titmuss Professor of Social Policy at the London School of Economics. He is an economist by training with a Ph. D. in economics from the University of Pennsylvania, and is a former member of the Economics Departments at the LSE and the University of Sussex. He is a Founding Academician of the Academy of Learned Societiesfor the Social Sciences. In 2003-5 he was seconded to No 10 Downing St as a senior policy adviser to the Prime Minister. As well as his position at No 10, he has acted as an adviser to the the President of the European Commission. The World Bank, the World Health Organisation, Her Majesty’s Treasury and the UK Department of Health. may I ask you what would it be the difference of your proposal (the QIR) and a debt write-off? Wouldn’t it have the same implication than depreciating the currency for highly indebted countries (Greece)? In fact the when the financial transactions (or debt positions) are temporarily converted to a newly denominated currency and “re-exchanged” with euros at a new rate, we just witness a reduction in the burden for indebted countries and an increase for creditors (Germany) which is, in my view, the same as debt write-off. Surely I missed something in your explanation but I would be very thankful to you if you could help me see through this. if you were to read Mr. Le Grand’s entire paper on QIR, you would have a much better understanding. (The link is under the article) He states that Germany should be the one to leave and come back, because it will help them from an increase in inflation. He does not suggest a debt write-off, but rather brings forth debt as something the countries would need to keep their mind on and pay back once things begin to stabilize. The paper identifies all problems, including the actual shift in currencies, making QIR an implausible correction to the EU’s troubling economy. What I suggest is that rather than having any country leave the EU, its members should be working together to become more stable. If competitiveness is the biggest problem for Mr. Le Grand I don’t understand how temporarily getting rid of countries will help improve the situation in the long run. The EU was formed so that these nations would not have to face these problems alone, but could rely on each other for support. Since Germany clearly holds the best standing in regards to the other nations, Germans should be willing to help the Greeks. What Germans fail to realize is that the main reason exports have been so high, is that Greece has been keeping the Euro from appreciating in value. Here lies another problem with Le Grand’s theory. Germany will have a drop in imports, thus devaluing the nation. If Germany can stay strong and bail Greece out, we are looking at a more plausible solution. Spain, on the other hand, seems as though it does not need nearly as much help from outside nations. Like Le Grand stated, overspending by governments is a major cause for today’s situation. If Europe cuts back on spending and keep interest rates low, we can begin to look at a long process of recovering. Trying my best to learn and implement new ideas and this sort of article shines a new light on solutions for the European Union’s current situation. -This comment has been edited by the EUROPP editor for readability. This comment has been edited by the EUROPP editor for readability.